Certainly the huge rock, rising over 180m above the river, is an unmistakable landmark. The Rhine River bends to its narrowest point at the base of the Lorelei and, with a depth of 22m, that narrowness creates an unusually strong current that hides treacherously submerged rocks and sand banks. Although protected by the “Warschau” warning light signals (operated from the river control headquarters at nearby Oberwesel) and the use of specialist river pilots, numerous incidents still happen. As recently as 2011, a barge carrying 2400 tons of sulphuric acid from Ludwigshafen to Antwerp, capsized blocking the river for days – causing major disruption along what is, in reality, the major aquatic highway of Europe and costing the German economy Millions in damages. Since the early 19th century, blame for these strings of disasters have been laid on a female river spirit imagined by the writer Brentano and then woven into a dream tale by Germany’s then favorite Romantic poet Heinrich Heine who was fascinated by the Rhine and its ancient Niebelungen myths. Heine’s song was captured in his “Buch der Lieder”, which then became one of the most popular books ever published in Germany. Some years later composer/songwriter Friedrich Silcher added music to Heine’s verse and a popular classic was born – intriguing artists and visitors ever since – not least of which because of the endless cruise ship playlists that feature the song as they pass the rock. A brief list of the artists inspired by Heine include Franz Liszt (who wrote the song “Die Lorelei” in 1841), a propagandist painting by Oskar Kokoschka in 1941, and more recently a poem by Sylvia Plath (“Lorelei“, 1960) , who reflected on the Rhine Maiden’s actual silence as its most disturbing aspect. For most travelers, however, a bronze statue of the Rhine Maiden combing her long golden hair, created by Natascha Alexandrova (aka Princess Jusupov) placed on a jutting extension to St Goarshausen in 1983, is the most obvious reminder of the legend created by Brentano and Heine. Heine lived in turbulent times. While studying at Bonn University, he joined the new Nationalist movement. In 1819 the students threw “unpatriotic” books and papers into a huge bonfire. He recoiled in horror, later portraying a character in his tragic play “Almansor” who, reacting to the burning of the Koran and the Inquisition during the Reconquest of Spain , by proclaiming “where people burn books, in the end they burn people” . This is now inscribed over the entrance to Yad Vashim Holocaust Museum in Jerusalem, the US Holocaust Museum in D.C. and the Opernplatz, Berlin. Despite converting to Protestantism (in 1825) as his “ticket” of admission to European culture, Heine still ended up getting thrown out of Germany by the Nationalists he was once a part of and exiled in Paris, albeit as a celebrity. Analysing extremism on the Right he wrote that “Thor will leap to life with his giant hammer and smash the Gothic cathedrals” (painting a picture of the legendary hero destroying the iconic images that were held up as the traditional basis of a German identity). Later then, after meeting Karl Marx (an admirer of Heine’s at the time), he foresaw that “the future belongs to the Communists. With fear and terror I imagine the time when those dark iconoclasts come to power”. 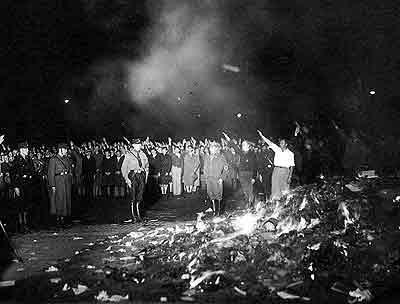 His words were prophetic, essentially predicting the rise of both Stalin and Hitler – with the result that, in 1933, as books were burnt once more nationwide in Nazi Germany, Heine’s books were included amongst those of Einstein and Freud. Adolf Hitler, like Heine was fascinated by the myths of the Rhine (although as interpreted by Richard Wagner) and often came to contemplate the river. He normally stayed at the picturesque Rheinhotel Dreesen at Bad Godesberg, sometimes on matters of state (meeting Chamberlain which led to the Munich Peace Pact), sometimes to fantasize on his destiny. From this location, downstream from the Lorelei, he decreed that, although the song of the Lorelei could still be published, it had to be attributed to an “unknown author”. When Nazi-led armies reached Paris in 1941, German Radio reported “on Montmartre, the grave of Heinrich Heine, the famous German Jewish poet, has been desecrated and demolished with no trace of the grave left”. Today the grave has been rebuilt, and monuments to Heine stand in both Paris and Berlin, as well as St Goarshausen by the Lorelei. Hitler’s fascination with the Niebelung myths continued to his last days in the bunker in Berlin. Original manuscripts of Wagner’s Rienzi and Götterdammering stayed with him to his dying day. He ordered the Siegfried Funeral March, the death of the hero, to be played over the loudspeaker system during his last days in the Berlin bunker that served as his headquarters, and after their suicide, the remains of Hitler and Eva Braun were burnt, like those of his hero Siegfried, on a funeral pyre. 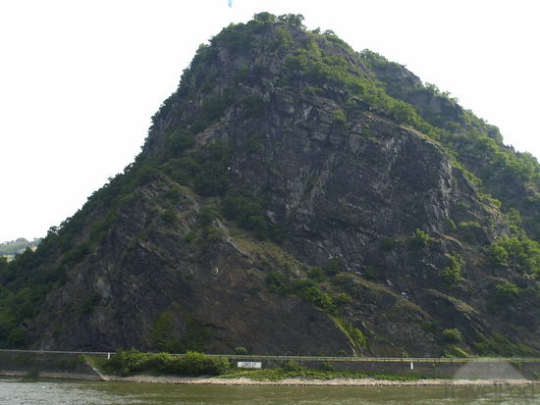 So the granite rock at Km marker 555 is a major feature of any Rhine journey, with its still present dangers and ghosts, and its anchored dreams and ideas.